This makes no sense. The NFL has either investigated and made a conclusion without speaking to Winston, or they’re just dragging their heels unnecessarily. Surely they’d want to resolve what could be a PR nightmare ASAP. The NFLPA would go ballistic if Goodell suspended one of its own under the Personal Conduct Policy without interviewing the accused. I understand Goodell s authority in article 47, I just find it hard to believe he would set this type of precedence. That would go far beyond the Elliot situation, especially when there’s someone directly contradicting the accuser’s story. I wonder if they’ve id’d passenger number 3 and have left it at that after speaking to him. Whatever the outcome, I highly doubt Winston didnt cooperate with the league. I have no issue with him publically not giving out any info. In this current legal climate, the less you say the better regardless of guilt or innoncence. It may not matter but I wonder if winston came forward to the Bucs in May of 2016 when he was accused of this from uber that this may have been resolved quicker? Looks like the regular season schedule is coming out Thursday. Besides the mandated Thursday night game, I think they get a Monday night game. My prediction is Eagles at home on Monday night. This might be his last season here. Hopefully he balls this year and makes bank next year. Given the way our cap situation is looking for 2019, I hope he gets his long term deal here next offseason and we move on from Jackson. Could be a cheaper alternative and a way of keeping (almost) everyone happy. Am I missing something on Humphries? The guy is a replacement level player. I just have a massive mancrush to be honest. Fair enough lol. Nothing wrong with that. This is interesting. Not sure what they used to come up with this though. Winston needs to be more consistent. And a lot of that means being more decisive in red zone area and quicker decisions need to be made. That’s where he struggles. 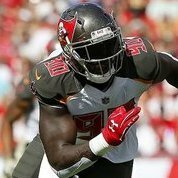 Yes an improved running game should help but winston’s weakness is decisiveness and a reason why he takes more sacks than he should is he holds on to the rock a little too long.